A large capacity and top-of-the-line features don't have to come at an excessive cost. 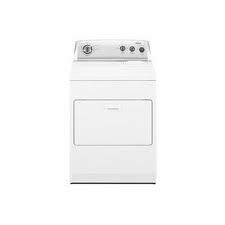 The Whirlpool WGD5300VW 29" Gas Dryer has enough options to keep even the most demanding household satisfied when it comes to drying needs, without breaking any budget. A simple look combined with cutting edge technology makes this dryer a great addition to your home. This appliance provides everything you need to get a dry load of laundry with minimum fuss. Get a completely dry load of laundry quickly and efficiently, thanks to the AccuDry Sensor. This feature monitors each load's moisture content and temperature levels in order to determine the right time to stop each cycle. Once the load is dry, the cycle ends, preventing overdrying and reducing energy consumption. You save time and money by lowering energy costs and reducing damage to the fabric. Twelve automatic cycles are there to answer all your drying needs, including Heavy Dry, Delicate, Jeans, and Damp Dry cycles. If you can't unload your dryer right away, not to worry! The Wrinkle Shield Plus option lets you delay unloading thelaundry for up to 90 minutes after the end of a cycle. Wrinkles and odors are kept at bay, thanks to intermittent tumbling of clothes after the cycle is done. There is a Timed Dry option up to 70 minutes. An extra-large, top-mounted lint screen keeps unsightly lint from messing up your garments. The Quiet Dry Noise Reduction System ensures quiet, smooth operation. An interior drum light adds to your ease and convenience during loading and unloading. A clean white paint finish gives this dryer an attractive, uncluttered look. Easy to operate electro mechanical controls are located on the rear panel of the dryer, with an adjustable On/Off End-of-Cycle signal. Leveling legs allow you to place your dryer anywhere without fear of instability or wobbling. The wide-opening hamper door gives you room to easily load and unload garments. You can fold clothes easily, thanks to the access granted by the drop-down door. This dryer really gives good value for money, considering its capacity, features, and price range. The large capacity is a plus for many consumers, especially for big families. Clothes are dried quickly, thoroughly, and efficiently. There are no additional steam cycles. If you want a dryer that eliminates the need for ironing, a dryer with steam options may be the better choice. This dryer is not Energy Star-rated. CEE rating is not available for this dryer. This dryer is not ADA-compliant. Comments for Whirlpool WGD5300VW 29" Gas Dryer 12 Cycles (White) 7.0 Cu. Ft.
After owning this dryer for a year it started to make a loud rumbling noise toware the end of the cycle. We had an authorized repair person come out to figure out what was going on. After replacing the rollers and then the drum the noise is now back. Since we have now owned the dryer for 18 months Whirlpool will not stand by the warranty even though it is an ongoing problem. They have not resolved the issue and now tell us we should have purchased the extend warranty. Our previous Whirlpool dryer lasted for 22 years and then we started having issues, which is understandable. So we did not hesitate to purchase another Whirlpool. Never again! The repair people cannot figure out what is going on and now we have to pay $119.00 just to have the repair person come out again to service this piece of junk.